This week US Secretary of State Hillary Rodham Clinton is due in Beijing. Her visit is part of a high-level series of talks on trade, politics and strategy. But space inside the US Embassy will be tight. Activist Cheng Guangcheng is holed up within causing more than an accommodation issue. Cheng has a long history of standing up for human rights in his home province of Shandong. He was once lauded by the national press in China. Despite an illness at age five that led to his total blindness, Cheng learned law and used his knowledge to help the poor and marginalised. His compassion and charity were applauded. Later Cheng focused his attention on the human rights abuses by local officials in pursuit of their population control methods. He stood up for women who were forced to undergo sterilisations and abortions. He brought to the fore severe abuse by authorities as they sought to maintain their population control quotas. Until last week, Cheng was under house arrest in his village of Dongshigu. Locals tell of around the clock guards, security cameras and a concrete wall enclosing the home. He had spent time in prison, and he and family members reported they were beaten by police. He had been under house arrest since September 2010 when he finished a four year prison sentence. The details are sketchy and Cheng is not offering facts. Apparently he left his compound and fled on foot. He fell “at least 200 times.” He was then picked up by supporters and driven to Beijing. Those who have admitted to helping Cheng have been arrested or are in hiding. He is purported to be in the US Embassy yet there has been neither confirmation or denial of this from American officials. 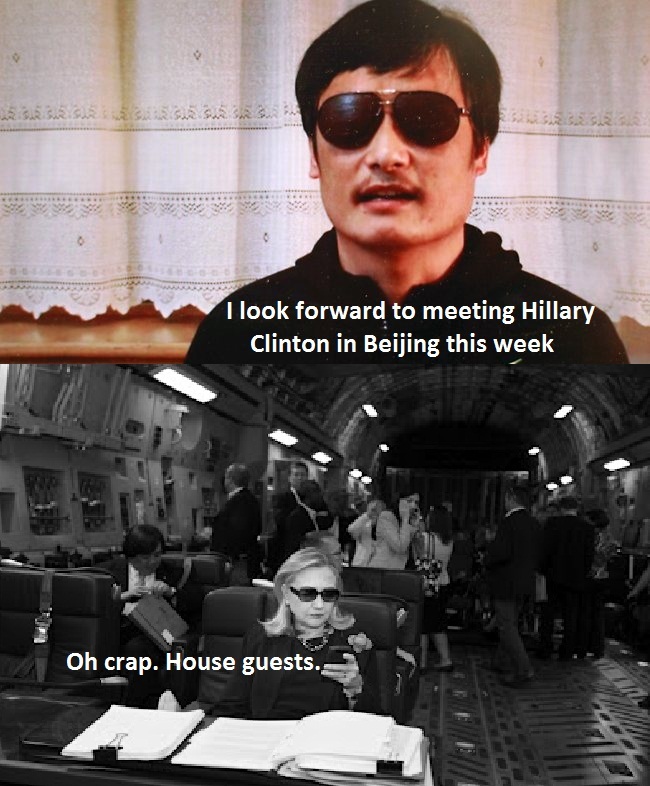 On Thursday Clinton is due in Beijing for high-level talks. Clearly the sheltering of a high-profile activist will be an impediment to open dialogue. Yet given the sensitivity of Cheng’s work it’s unwise for the US to eject him from the Embassy. The “right to life” movement is politically influential in the US. Should Obama’s Administration eject an anti-abortion activist from the US Embassy in an election year the tale of Cheng will become political fodder. According to a video released by Cheng at the weekend he seeks to stay in China. He asks for an end to beatings and a return to normalcy for himself and his family. That was then. This is now. Wang was a possibly crooked cop trying to escape an even crookeder politician. Cheng is a blind lawyer who supported women forced into abortions and sterilisations. Politically it is easy to step away from a corrupt public official. It’s a lot harder to abandon a birth rights activist. On Thursday Hillary touches down. She had hoped to dive straight into talks on trade, politics, strategy. Instead she has an uninvited house guest to deal with. How this is resolved will play a big role in near term relations between the United States and China. Watch this space. Or if you’re blind like Cheng Guangcheng, listen closely. Things are going to get interesting.